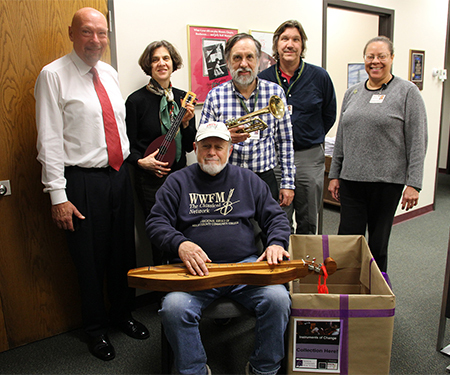 West Windsor, N.J. – In observance of Giving Tuesday on Dec. 1, WWFM The Classical Network hosted a musical instrument drive, in partnership with Princeton University, that has significantly added to the supply of musical instruments for the Trenton Community Music School (TCMS). Members of the public supported “Instruments of Change” in droves, with a final tally of nearly 100 instruments collected for the school. In addition to the more standard donations of flutes, trumpets and clarinets, the drive also yielded a dulcimer, ukulele, military bugle and three pianos. According to WWFM General Manager Peter Fretwell, the project was conceived to provide the school with musical instruments that are no longer being used, either because children have outgrown their first instruments or have shifted their interests away from playing. WWMF staff members were all in for "Instruments for Change." Standing, from left, are General Manager Peter Fretwell, Development Director Diane Guventis (with ukulele), Program Host Carl Hemmingsen, Music Director/Program Host David Osenberg, and Program Manager for JazzOn2 Winifred Howard; seated, Program Host Allan Kelly (with dulcimer). Not pictured: Production Manager/Program Host Rachel Katz. Founded in 1998, TCMS represents hope for both young people and the future of classical music. The school is in the start-up phase of an intensive afterschool orchestra, in partnership with the Trenton Public Schools. “The entire staff of WWFM is delighted to support the school’s efforts to help young people learn to play an instrument and have the experience of coming together and making music as an orchestra,” Fretwell said.